Well for the last 24 years, I have sworn to anyone who would listen that our homework that night was harder than it sounds – especially if you, like me, were kneeling in front of your aunt’s TV manually flipping between ABC, CBS, and NBC to see whether Peter Jennings, Dan Rather, or Tom Brokaw would be first to call a state. The notion that the parties’ colors were so easily interchangeable might sound odd in today’s “red-state, blue-state” America. But our (d)evolution toward hyper-polarized, color-coded orthodoxy – red always equals Republican, blue always equals Democrat – is a fairly recent phenomenon. The New York Times and Washington Post wrote about it during its infancy in 2004; Smithsonian Magazine offered up a detailed history in 2012; and the Washington Post chimed in again last year. All are fascinating reads. In 1976 (Carter over Ford), NBC and ABC unveiled national maps. NBC’s was elaborate – using thousands of light bulbs that initially melted the plastic states, as Smithsonian Magazine recounts – while ABC’s was more basic. 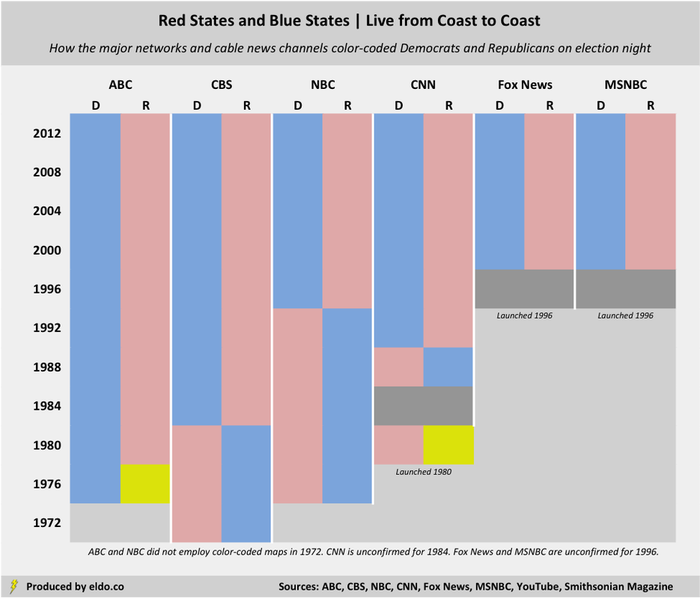 Like CBS four years earlier, NBC used blue for Republicans and red for Democrats. ABC, meanwhile, went with yellow for Republicans and blue for Democrats. CNN debuted in 1980 with yellow for Republicans and red for Democrats. CBS and NBC’s original designations – blue for Republicans, red for Democrats – stand in opposition to contemporary America’s prevailing (and seemingly irreversible) party-color associations. But they align with global norms – blue for conservative or right-wing politics, red for liberal or left-wing politics. In fact, the Smithsonian article points out that NBC first took its party-color cues from abroad (namely Great Britain). Beyond that, America’s history of electoral color assignment is haphazard, anecdotal, and rife with speculation. One theory suggests that the networks adopted a formula in 1976 that alternated the incumbent party’s color assignment every four years. But the Smithsonian story refutes that claim – and our chart disproves it. ABC was first to make the switch to red for Republicans and blue for Democrats, doing so in 1980. Here’s Frank Reynolds declaring that “the map is predominantly red, because red is the color for Reagan on our map”. CBS followed suit with the 1982 midterms and 1984 presidential election, Dan Rather’s first of six in the anchor chair after replacing Walter Cronkite. CNN did the same in 1992. No station ever switched back. NBC is the only major station to stick with blue for Republicans and red for Democrats through the 1992 presidential election, thankfully proving that my memory of a frustrating night with the crayons on November 3rd of that year is not some bizarre fantasy that I haven’t stopped thinking about about for 24 years. The Peacock Network made the leap with the 1994 midterm elections. That makes Clinton-Dole 1996 the first presidential election to feature today's familiar Republican-red and Democrat-blue across the television board. On-screen uniformity in hand, Bush-Gore 2000 is credited with cementing the modern American meaning of red states and blue states – thanks to its polarizing 36-day recount, the proliferation of 24-hour cable news, and the never-ending stream of electoral maps we saw as a result. And so it is, with tragic irony, that the only thing we can agree on in politics is how to divide ourselves. The only time we relied on a non-video source was for NBC in 1976. NBC's coverage of the 1976 election is documented by Smithsonian Magazine. Or at least so it seems when we peek at the map over the shoulders of Bernard Shaw and Mary Alice Williams. CNN remains unconfirmed for 1984. There is no map behind either pair of studio anchors and their vote-count graphics do not color-code the candidates. ​ Here's CNN in 1988 using blue for Republicans and red for Democrats. We are unable to confirm their color choices for the 1990 midterms (they could have switched then). In any case, they were definitely Republican-blue, Democrat-red in 1988 and Republican-red, Democrat-blue in 1992. At least not for presidential elections. Once they switched, they stayed. We did not review midterm elections except to pinpoint a given network's transition (where possible, given midterm footage is often unavailable). So it's technically possible a station switched back for a single midterm, then switched again for the next presidential election, thus remaining consistent from presidential election to presidential election while obscuring some aberration in between. But I doubt it. ​ Fox News and MSNBC both launched in 1996. Their 1996 election night coverage is frustratingly difficult to locate. They remain unconfirmed. The Washington Post notes that Time magazine used blue for Republicans and red for Democrats through the 2000 election, so the color scheme wasn't quite universal across media. Electoral nerds (a term I use with endearment) will note (or if they're truly electoral nerds, will already know) that David Leip's popular U.S. Election Atlas continues to use blue for Republicans and red for Democrats.